If you’ve read this book, then you’ll know that Little Miss Somersault never did anything normally. Sit at the breakfast table? 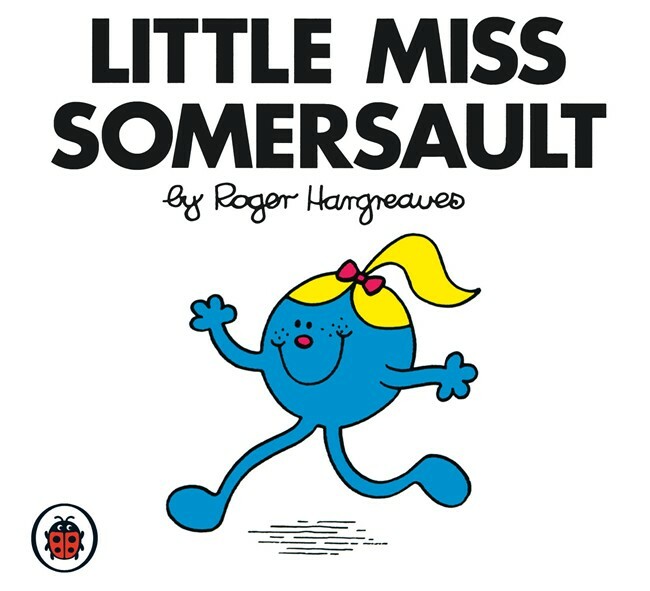 Oh no, not Little Miss Somersault! Little Miss Somersault eats breakfast balancing on the back of her chair. These books should really come with disclaimers: Kids, Little Miss Somersault is a professional acrobat. Do not try this at home! Of course, we agree with Little Miss Somersault. Breakfast should never be boring! It should always be interesting, delicious, and healthy, of course. However, instead of eating breakfast standing on your head (that could have unfortunate complications), why not make your breakfast upside-down? 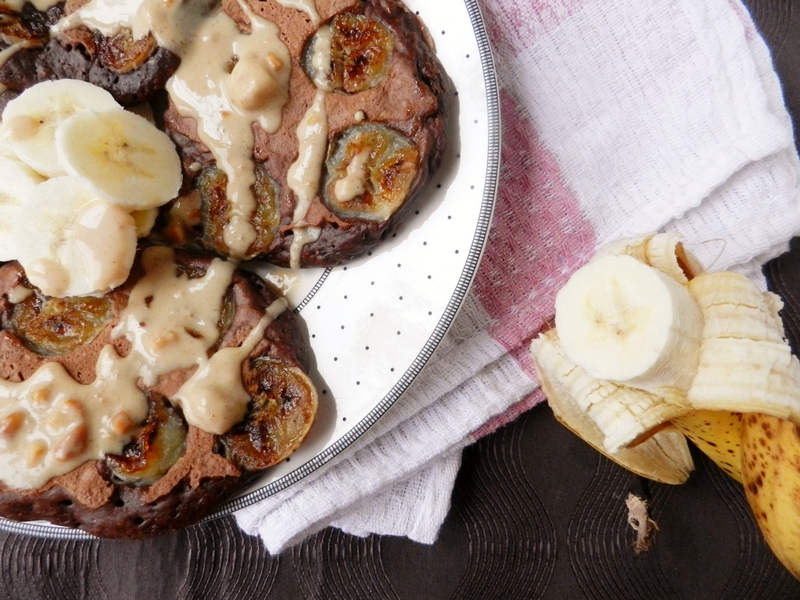 Why not have some Chocolate-Banana Upside-down Pancakes? And the obvious next step is adding a warm peanut butter sauce! Because in our opinions, the 3 best flavour combinations in the world are Peanut Butter-Chocolate, Peanut Butter-Banana, and Peanut Butter-Chocolate-Banana. Hands down. 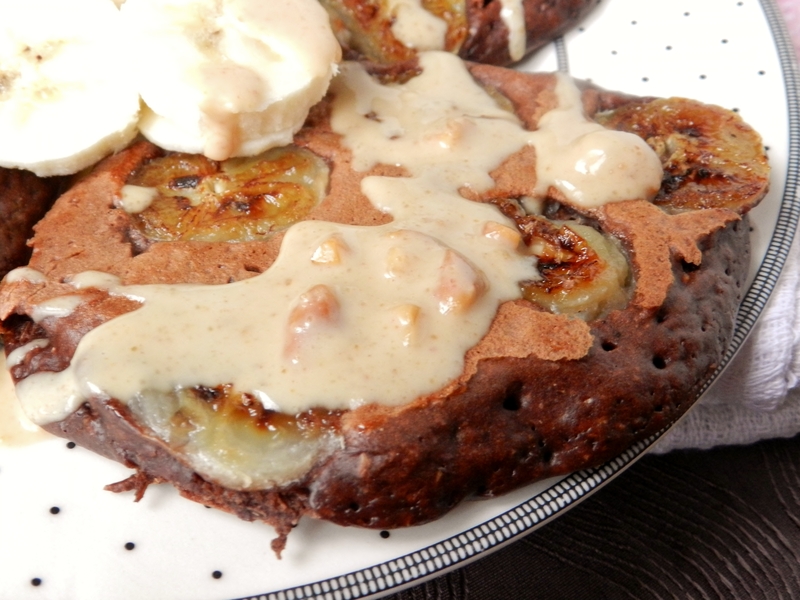 And if you’ve never tasted the wonder that is caramelized bananas, you haven’t lived! Ok, so that might be a little dramatic, but seriously look at those bananas! You cannot possibly say that doesn’t bring on the drool-factor. We are unashamed to admit that we are actually drooling while we write this post- food blogging isn’t always pretty, folks! Pre-heat a pancake griddle or frying pan over medium heat. In a medium-sized bowl, combine flour, cocoa powder, baking powder, baking soda, and salt. In a separate bowl, combine egg, milk, vanilla and butter extract. Add the wet ingredients to the dry ingredients and stir until fully combined. Drop spoonfuls of batter onto your griddle or pan and spread so they are round. Place the banana slices on top of each pancake. Cook for 2-3 minutes, or until you see bubbles forming and the edges are cooking. Flip and cook for another 2-3 minutes. Continue until all of your batter is gone. 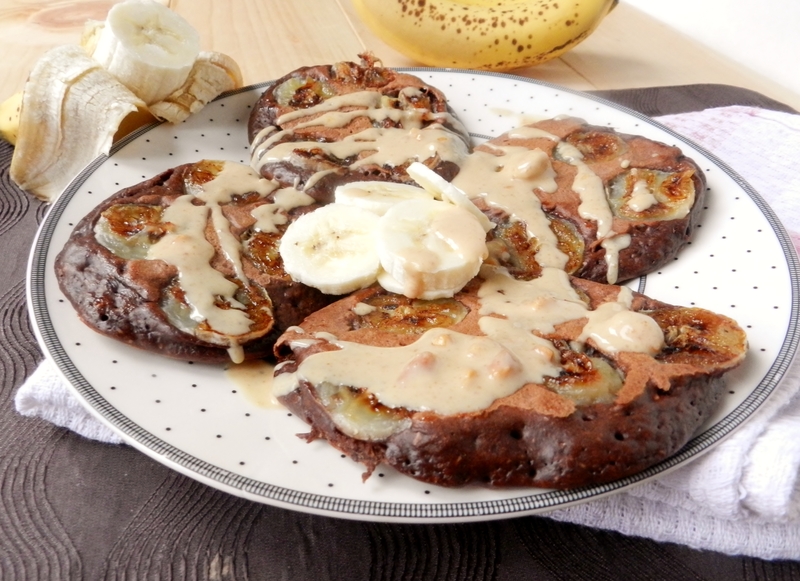 Arrange pancakes on a plate, top with additional bananas and warmed-up peanut butter. Enjoy! Did you ever read the Little Mr. and Little Miss books? What are your favourite flavour combinations? 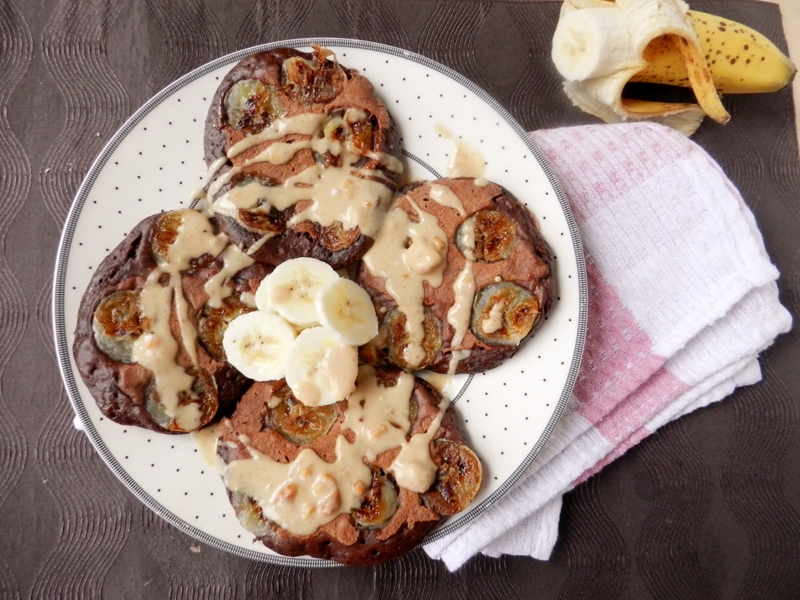 Posted in Uncategorized and tagged bananas, books, breakfast, chocolate, chocolate banana, chocolate peanut butter, drool factor, easy, food, healthy, Little Miss Somersault, low fat, pancakes, peanut butter, peanut butter chocolate, peanut butter sauce, sugar-free, upside-down, whole wheat flour. Bookmark the permalink.